You might have noticed that over the weekend, we’ve made a new addition to the Internet and Democracy blog’s normally static header. We’ve been hard at work behind the scenes and we’re happy to officially announce today that we’re launching the very first edition of the I&D Tools Database! The Database is designed as an ongoing aggregation of the many established and emerging digital tools that we encounter in our research. In addition to cataloging the functions particular tool serves, it provides information on a tool’s user base and a brief description of its development history. Notably, it will also act as a log of the political uses (if any) that we’ve seen these tools used for in the wild. It’s hoped that that the database will be a useful resource for researchers, activists, and anyone else interested in the intersection of tech and politics. Looking through it now, you’ll see that its a basic start, but we’re already working on some plans to expand the effort in the future iterations of the project with more entries and richer data. At some point, the I&D project is also considering relaunching the database as a wiki-based initiative to allow interested parties and some of the individuals who use these tools in practice to contribute new entries or enrich the descriptions that we have. If you’d be interested in getting involved with this effort, drop Tim Hwang a line at thwang at cyber.law.harvard.edu! This past week the Internet & Democracy Project was kind enough to sponsor my attendance at the Global Voices Citizen Media Summit in Budapest. 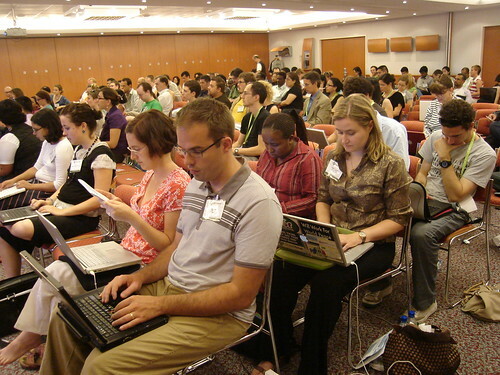 It is an international gathering of the members and fans of the international blogging project Global Voices, which curates the world’s blogospheres in order to increase cross-cultural understanding. This year, the summit focused on limitations of free speech online, both technical forms of censorship like filtering and offline forms of censorship like illegal imprisonment. This touches on the themes of the Internet & Democracy project in so far as freedom of expression is a key element of democratic societies. Without the ability to freely access information and discuss its relevance to public issues, it is impossible for citizens to make informed policy decisions and to determine where their own best interests lie. The online space, particularly blogs, present an opportunity for citizens to share and discuss information that is not available in the mainstream media, yet authoritarian governments are trying to close this loophole. Also, as Egyptian digital activism Alaa Adbel Fatah mentioned during a Q&A session, the Internet is not only a place for citizens to share information and discuss its importance, but also to organize for action. Egyptians’ use of Facebook in organizing a general strike last month, is a vibrant example of the ability of the Internet to help citizens organize for collective action. The government’s reaction, which included the arrest and torture of activists involved in the online campaign, is a vivid example of the government’s desire to close off the democratic potential of the Internet to empower citizens. The part of the conference which is most directly connected to the I&D project was the session on the wired electorate and emerging democracies. The session featured several cases about how bloggers are playing an important role in monitoring elections and providing reliable information to citizens when traditional media is shut down or censored. Panelists Onnik Krikorian from Armenia and Daudi Were from Kenya provided particularly useful case studies of this phenomenon. I will end by cross-posting Patrick Meier’s excellent post on that session, originally published on his blog iRevolution. Is the Internet Reprogramming us? Nicholas Carr’s well crafted piece in The Atlantic seems to be suggesting a fate far less neutral, and in particular, if the title is to be believed, “Is Google making us stupid?”. Carr loses me when that point becomes “we are how we read, and how we read thanks to the Internet lends a diminished capability of deep thinking,” but the progression between the premises and the conclusion are nonetheless worthwhile because it provides an interesting description of why different media of communication may breed different mental processes. The elegance of the sentence is nearly enough to make one believe, but I have a hard time “decoding” what exactly Carr means or is suggesting happens during deep reading. In particular, it is difficult to read that paragraph without wondering if Carr means to imply that “the intellectual vibrations” are separable, or aren’t directly linked to the attainment of knowledge, as if the process of going through a physics theorem until the process described is actually understood doesn’t produce the reverberations Carr appears to be referring to. Perhaps the problem is that we have not become mere decoders, but creatures that don’t even have the patience to decode, that don’t have the discipline to read through a lengthy piece so as to actually attain that knowledge. That would be a legitimate concern, although it’s unclear to me that the “ethic” of the Internet—if it has one–promotes intellectual laziness. This week I am in Budapest for the Berkman Center’s conference on “Building a Framework for the Study of Internet and Democracy” (and the Global Voices 2008 Summit later in the week). I have been invited to moderate the panel on “Democratization and Authoritarian Regimes,” which closely overlaps with the topic of my dissertation. * Networked Public Sphere and Media. This panel will ask whether networked communication will lead to more democratic, deliberative and inclusive public spheres. The panel will include presentations by Lance Bennett, Bruce Etling and Michael Xenos. * Methodology. As the title suggests, this panel will address challenges in methodology and research design vis-a-vis the study of the Internet’s impact on democracy. Michael Best, Corinna di Gennaro and Victoria Stodden will figure as panelists. * Political Parties and Elections. Does the Internet make a difference to election campaigning by increasing citizen participation and turnout? The panelists for this discussion will be Urs Gasser, Rachel Gibson and Stephen Ward. * E-Mobilization and Participation. This panel addresses the topic of digital activism. Networked technologies are said to unite, motivate and enable citizens to take their political future into their own hands. What impirical evidence exists? The discussion will include presentations by Marshall Ganz, Helen Margetts and Beth Kolko. * Democratization and Authoritarian Regimes. Is the information revolution empowering repressive regimes at the expense of social movements? The panel will weigh the arguments presented by cyber-optimists and skeptics. Joshua Kauffman, Gwendolyn Floyd and John Kelly will figure as panelists. Clearly the panel topics interweave which should make for a rich dialogue over the two-day period. I plan to blog live from each panel (apart perhaps from the one I’m moderating). The first panel at the Berkman Center’s conference on Internet and Democracy in Budapest, Hungary, was launched with an engaging presentation by Lance Bennett on youth civic engagement and new, participatory media. Lance clearly showed how traditional notions of what constitutes a citizen is changing. The focus today is on on lifestyle politics and affiliation rather than static membership. Some examples of youth-based, online initiatives include Puget Sound Off and Your Revolution. The latter is a Facebook application that allows you to register to vote straight from your profile. The application also allows you to invite your friends to register and to connect with other groups, projects and conversations. Michael Xenos gave the second panel presentation on new mediated deliberation. The problems of traditional deliberation is that the “space” for dialogue is constructed with a limited role for non-experts. Michael poses the following question: how do blogs compare to traditional news outlets in terms of serving mediated deliberation? For example, amount of coverage, constructed debate and deliberative opportunities? He presented the findings from his current research that reviewed the New York Times stories on Alito and the reaction of this coverage in the Blogosphere. Using content analysis and regression analysis Michael concludes that the Times coverage appears to be “event-based” in comparison with the “information-based” nature of blog discussions. Independent patterns of discourse emerge in Blogs. Some questions for future research include: how can we compare the editorial decisions of a networked system to those made by traditional editors and news outlets? How can we further trace the indirect effects of online deliberation? * Have the gatekeepers really been removed, or just repalced by a new set? * Who determines who is allowed to speak, how open is the space really? * Has something enw occured? is a new type of political behavior made possible by the effective distributed collaboration allowed by the interent? * How does filtering for accreditation and political relevance occur? * Agenda setting and meme tracking: where did the story start, who started it, when? * Amplification: when did story go viral, where, and how was it amplified; when did it die? * Iran: what issues are allowed to be discussed in the blogsphere v newspapers? The second panel kicked off with a presentation by Rachel Gibson and Stephen Ward entitled: “Reinventing the Party? The Role of ICTs in Party Politics.” For this research, Rachel and Stephen examined the influence of ICTs on parties campaigns and organizational change, drawing on cross-national research in five European countries. The new era of campaigning is characterized by increased personalization, targeting, and shift towards informalizing politics. Interactivity and decentralization/fragmentation are also defining features. The assumption is that the effect of ICTs on party systems is enhanced pruralism via lowered costs and fewer edited communication. The general conclusion is normalization. Major parties still pre-dominate (content/connectivity) although it is a more equal communications medium for minor parties than TV, radio, and print. New media “widens” rather than levels the communication playing field. Some questions still remain, however. Are ICTs extending the reach of political parties? Are they deepening engagement? Are they flattening hierarchies? Extending reach of parties? ICTs as a recruitment tools? Increases in efficiency, marketing; collapsing geo boundaries; reaching new audiences. Deepening engagement: ICTs as actvist tools? Online recruitment is becoming the most important method but is replacement rather than an additional method. Overall, most survey evidence suggests those who engage online are already politically active. That being said, there is some potential to reach beyond usual suspects (especially students) but dependent on, the issues, methods and style of engagement (viral marketing/humor is important). ICTs also generate additional participatory spaces; networking and enabling activists. Flattening hierarchies: ICTs as democratic tools? Is activism deepening? Only ICTs most used by already active (super activists?) to engage further; more educated/informed activist & supporters; but, online joiners relatively passive? Networked individualism – increasing connections but weak ties? Are ICTs changing parties? They encouraging low intensity participation. ICTs are used to enhance profile of leaders; erode traditional geographical collective structures; creatie new communities of interest around personalities & issues; beginn to reshape parties & impact on party democracy but outcome depends on indiviudal party (goals and culture). In conclusion, parties adopted cautious approaches to new ICTs; ICTs accelerated some trends that pre-date Interent (personalization, invidividualism); Renewal via ICTs unlikely since technology alone does not address fundamental disatisfaction with parties. However, ICTs may well be beginning to reshape and reconfigure party organizations; No one-size-fits-all model, American patterns will not necessarily be replicated globally. Urs Gasser gave the second presentation. His interest is on political participation in advanced democracies, such as Switzerland where there are half-a-dozen elections per year. Urs gave the project SmartVote as an example, which provides information for citizens (users) with matches to candidates running for elections. SmartVote is basically a sophisticated profile matching tool. In 2007, over 85% of candidates running in elections participated in SmartVote by answering a questionnaire of some 70 questions. The most surprising finding is on the impact of traditional media vis-a-vis the success of SmartVote. One question is how this will impact political parties since this service matches individal candidates, not parties, with citizen preferences. The cultural factor turns out to be particularly important to the success of SmartVote. The website could also be used as an accountability tool by going back to the information posted by candidates following the elections. The third panel of the Berkman Conference on Internet and Democracy was started with a presentation by Marshall Ganz on lessons learned from traditional approaches to mobilization and how these compare with new methods. Some of the main points I took away from Michael’s presentation and the question & answer session follow. * Individual liberty, equality and collective capacity are three fundamentals of democracy. * Transformation and exchange are more important than aggregation of individual interests and values. * So what kind of institutional arrangements promote individual liberty, equality and collective capacity and how can/does the Internet facilitate this process? * Social movements arise from purposeful actors to form new partnerships, common values and collective action. There is often confusion between social movements and fads. * The role of leadership is a process whereby individuals are inspired to respond creatively and with a common purpose in the face of uncertainty. * Social movements mobilize individuals through tiers of leaders. Martin Luther King was not the only leader in the civil rights movements. The traditional perception of social movements led by one characteristic leader is misplaced. Social movements are not completely decentralized either. * Leadership is not about command and control but rather about mobilization. * Social action must be understood both in strategic and motivational terms. * While the Internet provides for anonymity, this undermines the sharing of experiences and common values. * While the dramatic reduction in networked communication has been discussed at some length, the motivational factor has not. The narrative, the common purpose and inspiration to act must be present in order to encourage individuals to turn to the Internet to seek further information and form social groups. Networked communication facilitates the dissemination of the narrative. * Q & A: Mobilization patterns on the Internet are different from those in good old traditional social movements. So how much from traditional social movement theory and practice apply? Helen Margetts gave a presentation on the Internet and the logic of collective action. vis-a-vis petitions Helen carrried out an experiment by drawing on the behavior of some 50 individuals (students and non-students). She used a treatment group and control group in order to measure differential impact. The first group received information about a petition and who else had signed the petition. Group 2 received no information. I moderated the final panel of the day, which focused on the impact of the Internet on democratization and authoritarian regimes. Gwendolyn Floyd and Joshua Kauffman led the first presentation. Gwendolyn and Joshua recently returned from a field study in Cuba and emphasized the importance of working in developing countries in order to seek insight into the possible future scenarios of the information society in repressive contexts. The exchange of non-state information in Cuba occurs at the extremities of informality. Indeed, distributed public spheres are facilitated by the distributed transportation network, i.e., taxis and buses. Clandestine libraries also exist. Because of limited ICTs and access, people have built their own antennas and satellite dishes (hidden under a potato bag as one picture revealed). Crackdowns and confiscations of satellite dishes and any connected technologies recently have recently occurred. This was because the state noticed that the youths began combing their hair differently, which they concluded could only be happening if they were exposed to (illegal) satellite television channel(s). There is Internet in Cuba, all through satellite. There is also a large parallel market that operates vis-a-vis ICTs. When Joshua and Gwendolyn were in Cuba they decided to put a sign up “Free Internet Access Available Here” in a marginalized neighborhood. People knew what the Internet was and suggested they take the sign down with haste lest they get in trouble. Flash drives are also widely used to share non state-controlled information. So Gwendolyn and Joshua have developed a device that allows for the rapid copying of flash drives without the need for a computer. This means that data on flash drives can be copied during a taxi ride, for example. The device also includes a small LCD screen and a built-in speaker. It can be operated using batteries and/or solar power. In addition, the device can be plugged into a television to watch video clips since there are virtually no computers in Cuba while one in five Cubans own a TV. Gwendolyn and Joshua also spoke about Cuba’s University of Information Science (UCI), the largest university in Cuba with some 10,000 students. The university is a direct extension of the state, which uses surveillance as market research on public opinion which they can then respond to without acknowledging the existance of the surveillance infrastructure. Students work on developing technologies and software for surveillance purposes, such as pattern recognition of visual images. For example, one project extracts headline information from CNN broadcasts by recognizing any text that might be displayed on the screen. This technology proved key in disseminating a YouTube video of (non-UCI) students challenging government officials directly at a university talk. It was particularly insightful to learn the selection criteria for students accepted to the program: (1) highly developed computer and analytical skills; (2) lack of world knowledge and interest in world affairs. Students are also kept on campus six days a week. The presenters are working on a follow up project to introduce the technology in Burma. The challenge, like in Cuba, is twofold: (1) how to extract sensitive information, and (2) how to create and maintain a secure network of sensitive information. One of the important findings from their research in Cuba was that people are not prepared to take on the responsibility that comes with democratic action and activism simply because the idea is particularly foreign to Cubans given the long history of state control. Understanding the local culture and history is absolutely critical before introducing any type of “liberating technology.” In Cuba’s case, the question is how to promote small “d” democracy? How does one ready a people for small “d” participation? Another question is whether technology that facilitates information dissemination increases incentives to engage in activist events because of the assurance that these will be widely distributed? John Kelly’s work blends social network analysis, content analysis and statistics to render complex online networks more visible and understandable. John began his presentation by showing the different structures/typologies/clusters of blogospheres in different languages. Which of the network structures might reveal more democratic societies? Individual blogs can also be color coded to represent different ideologies and attitudes to public issues. See my previous blog entry on the Iranian blogosphere here. John asks whether it is possible to have an online democratic society operate within an offline repressive regime? John compared the network structure of the Iranian and Russian blogospheres that showed evident differences in structure. The former was more mixed while the latter clearly more clustered. His network visualization software also depicts how the networks appear differently depending on where blogs are blocked or not within the countries in question. More detailed characteristics of individual blogs can also be depicted as a social network, such as age, areas of interest and so on. Of particular interest are blogs that critize the current goverment. Key word social network rendering can also be visualized, such as blogs that use terms such as democracy, Palestine etc. During the Q & A session, it was argued that the Blogosphere is not representative of any nation state in terms of age, gender, economic status, education, etc. On the other hand, even if Blogospheres are characterized by the participation of elites, the number of different elites and arguments/ideologies can serve as a good sign of democracy in (virtual) action. * How do we formulate testable hypotheses? * What existing theories can we build on? * What are appropriate methodologies? Michael Best gave the first presentation on various methodological approaches. He began by making a distinction between democracy and Democracy. The former is people-centric while the latter is state-centric. Michael defines the relationship between the two as follows: democracy in the absence of Democracy. The distinction provoked a serious of questions and discussions. Do we mean bottom-up versus top-down? Informal versus the formal? Are the terms mutually distinct? Are we better off thinking of a spectrum? As far as we know, there is no theory of everthing vis-a-vis the study of Internet and Democracy that relates small d and big D democracy. Quantitative studies (with K. Wade) suggest that a 1% increase in networks associates with a point increase on the democracy scale. Over the 1990s the Internet came to explain ten times more variations in levels of democratization. There is no statistically significant correlation between Internet usage and democracy in the Middle East and Asia regions. In his work, Michael combines natural language parsing with time series analysis and stylostatistical analysis. Another research question Michael is pursuing is how new interactive media can help to reconcile and heal a nation such as Liberia. A pressing challenge is how to reach out to rural Liberians. The project developed a rural interactive mobile multi-media kiosk that can be added to the back of a 4×4. See TRCofliberia.org for further information. Victoria Stodden is doing research to understand the relationship between Internet diffusion and democracy. The first stage of her research focuses on the Middle East and country-level analyses. The most reliable and consistent source of ICT data is from the International Telelcommunication Union (ITU), an organization that surveys local federal governments. On democracy data, the Freedom House data has a lot of inertia in that there is minimal variation in that dataset. The best source seems to be the World Bank Governance indicators. In particular, these include “Voice and Accountability” and “Rule of Law”. Her analysis suggests that beyond a particular threshold of “Rule of Law”, the amount of mobile phone use (per 100 inhabitants) takes off. The threshold figure appears to be 40 users per 100. Internet use appears to accelerate faster with an increase in “Rule of Law” figures. She also measured the World Bank’s “Voice and Accountability” indicator against mobile phone use and Internet use. The presentation prompted numerous backs-and-forths on the reliability of the data and the challenges of concluding certain trends. These are the same challenges that the conflict analysis field has faced over the past 5 years. Using macro-level aggregate data means making a host of assumptions regarding what these measurements mean vis-a-vis the questions we are asking. As long as we are transparent about these assumptions, there is no harm in proceeding with country-year econometric analysis. Ultimately, however, these studies need to be completemented with process-tracing methods and field-based qualitative research. This nested analysis approach is the one I am taking for my dissertation research. An O’Reilly Media blogger recently posted interesting demographic data concerning Facebook. The blogger highlighted the growth of Facebook’s international user base and raised questions about the market share of social networking sites. But, apart from this, the data encouraged me to consider the global digital divide and whether or not it is slowly closing. According to the report, the top three user countries (US, UK, and Canada) now only account for 61 percent of all users worldwide. Moreover, two of the Top 10 countries represent the Global South, namely Colombia and Chile. In fact, 21 of the 46 countries that appear on the list are middle-income countries of the Global South, including Mexico, India, Venezuela, South Africa, Malaysia, and Pakistan. It is clear that these developing nations are attractive emerging markets for proprietors of social networking sites and other forms of digital communication. Facebook may, in fact, be a useful barometer for the current status of the digital divide. Undoubtedly, site membership is an imprecise measure of Internet access across the globe, but it may be an indicator of a trend. And given the social, reciprocal nature of Facebook activity, it signifies the regularity of Internet use among a portion of patrons within a country. I realize I must be cautious here. After all, the digital divide is two-pronged, existing both between regions or nations and within countries. In reality, access to sites like Facebook, even in these rising middle-income countries, is far from unitary. Last month, Global Voices reported that seventy-five percent of Colombians are still without access. It appears that the paradigm of the North-South digital divide often overshadows the deeper routes of the access gap. In the end, discussions of Facebook and the digital divide may be just as circular as evaluations of Facebook and democracy. Stories of democratic activism within the Facebook groups of one country are often accompanied by reports of repression or censorship in another. I guess the jury is still out on both issues.